Orthofix Announces FDA Approval of the M6-C Artificial Cervical Disc to Treat Patients with Cervical Disc Degeneration | Orthofix Medical Inc.
LEWISVILLE, Texas--(BUSINESS WIRE)--Feb. 7, 2019-- Orthofix Medical Inc. (NASDAQ:OFIX), a global medical device company focused on musculoskeletal products and therapies, today announced U.S. Food and Drug Administration (FDA) approval of the M6-C™ artificial cervical disc for patients suffering from cervical disc degeneration. The M6-C artificial cervical disc was developed by Spinal Kinetics, a company acquired by Orthofix in April 2018. The M6-C artificial cervical disc is a next-generation artificial disc developed to replace an intervertebral disc damaged by cervical disc degeneration. 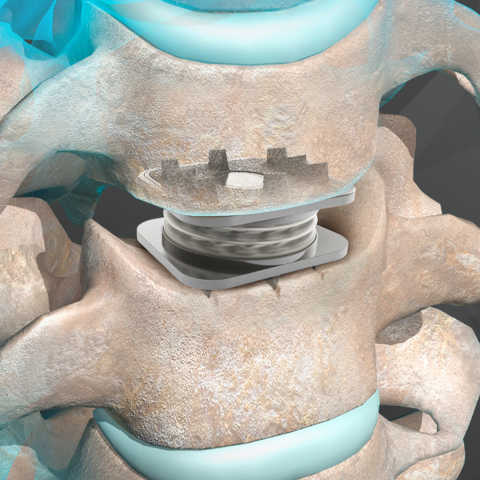 Designed to restore physiologic motion to the spine, the M6-C disc is indicated as an alternative to cervical fusion. The M6-C artificial cervical disc preserves motion by restoring biomechanical function at the treated level after native disc removal and potentially reduces subsequent degeneration of adjacent vertebral segments. The M6-C device is the only artificial cervical disc that mimics the anatomic structure of a natural disc by incorporating an artificial visco-elastic nucleus and fiber annulus into its design. Like a natural disc, this unique construct allows for shock absorption at the implanted level, as well as provides a controlled range of motion when the spine transitions in its combined complex movements. Pre-market approval was based on clinical data from a U.S. Investigational Device Exemption (IDE) study that evaluated the safety and effectiveness of the M6-C artificial cervical disc compared to anterior cervical discectomy and fusion (ACDF) for the treatment of symptomatic cervical radiculopathy with or without cord compression. Patients in the study presented with degenerative cervical radiculopathy requiring surgical intervention, and confirmed clinically and radiographically at one vertebral level from C3 to C7. 90.5 percent of patients who received the M6-C disc demonstrated a meaningful clinical improvement in the Neck Disability Index. A meaningful clinical improvement in arm pain score was seen in 91.2 percent of the M6-C disc patients compared to 77.9 percent in ACDF patients. In addition, this same meaningful improvement was seen in neck pain scores with 90.5 percent of patients who received the M6-C disc compared to 79.9 percent in patients who underwent the ACDF procedure. The M6-C disc preserved range of motion in flexion-extension and lateral bending in the study group. Prior to surgery, 80.6 percent of the M6-C disc patients and 85.7 percent of the ACDF patients were taking some type of pain medication for the treatment of their cervical spine condition. At 24 months, 14.0 percent of the M6-C disc patients were still taking some type of pain medication compared to 38.2 percent of the ACDF patients. Of the patients still taking pain medication there was a seven times higher rate of opioid use with the ACDF patients than with patients who received the M6-C disc. Additional surgery at the treated level was needed in 4.8 percent of the ACDF patients compared to 1.9 percent of the M6-C disc patients. The prospective, non-randomized, concurrently controlled, multi-center clinical trial was conducted at 23 sites in the United States. Orthofix expects to release the M6-C artificial cervical disc in 2019 through a controlled, limited market launch in the U.S. accompanied by an extensive training and education curriculum for surgeons. The M6-C artificial cervical disc received CE Mark approval for distribution in the European Union and other international geographies in 2006 and there have been more than 45,000 implants of the M6-C artificial cervical disc outside of the U.S. to date. The Company will conduct a conference call to discuss the FDA approval of the M6-C artificial cervical disc along with its fourth quarter and fiscal 2018 financial results on Monday, February 25 at 3:30 p.m. Central time (4:30 p.m. Eastern time). Interested parties may access the conference call by dialing (844) 809-1992 in the U.S. and (612) 979-9886 outside the U.S., and referencing the conference ID 7446347. A replay of the call will be available for two weeks by dialing (855) 859-2056 in the U.S. and (404) 537-3406 outside the U.S., and entering the conference ID 7446347. A webcast of the conference call may be accessed by going to the Company's website www.orthofix.com by clicking on the Investors link and then the Events and Presentations page. Orthofix Medical Inc. is a global medical device company focused on musculoskeletal products and therapies. The Company’s mission is to improve patients' lives by providing superior reconstruction and regenerative musculoskeletal solutions to physicians worldwide. Headquartered in Lewisville, Texas, Orthofix’s spine and orthopedic extremities products are distributed in more than seventy countries via the Company's sales representatives and distributors. For more information, please visit www.orthofix.com. This communication contains forward-looking statements within the meaning of Section 21E of the Securities Exchange Act of 1934, as amended (“the Exchange Act”), and Section 27A of the Securities Act of 1933, as amended, which are based on our current beliefs, assumptions, expectations, estimates, forecasts and projections. These forward-looking statements involve risks, uncertainties, assumptions and other factors which, if they do not materialize or prove correct, could cause Orthofix’s results to differ materially from historical results or those expressed or implied by such forward-looking statements. Therefore, our actual outcomes and results may differ materially from those expressed in these forward-looking statements. In some cases, you can identify forward-looking statements by terminology such as “may,” “will,” “should,” “expects,” “plans,” “anticipates,” “believes,” “estimates,” “projects,” “intends,” “predicts,” “potential,” or “continue” or other comparable terminology. The potential risks and uncertainties that could cause actual growth and results to differ materially include, but are not limited to: the risk that spine surgeons may be slow to adopt the M6-C artificial cervical disc; the risk that future patient studies or clinical experience and data may indicate that treatment with the M6-C artificial cervical disc does not improve patient outcomes, or otherwise call into question the benefits of its use to patients, hospitals and surgeons; the risk that the product may not perform as intended and may therefore not achieve commercial success; the risk that competitors may develop superior products or may have a greater market position enabling more successful commercialization; the risk that insurance payers may refuse to reimburse healthcare providers for the use of our products; and other risks and uncertainties more fully described in Orthofix’s periodic filings with the Securities and Exchange Commission, including under the heading “Risk Factors” in our annual and quarterly reports. You should not place undue reliance on any of these forward-looking statements. Further, any forward-looking statement speaks only as of the date hereof, unless it is specifically otherwise stated to be made as of a different date. We undertake no obligation to further update any such statement to reflect new information, the occurrence of future events or circumstances or otherwise. © 2019 Orthofix Holdings, Inc.